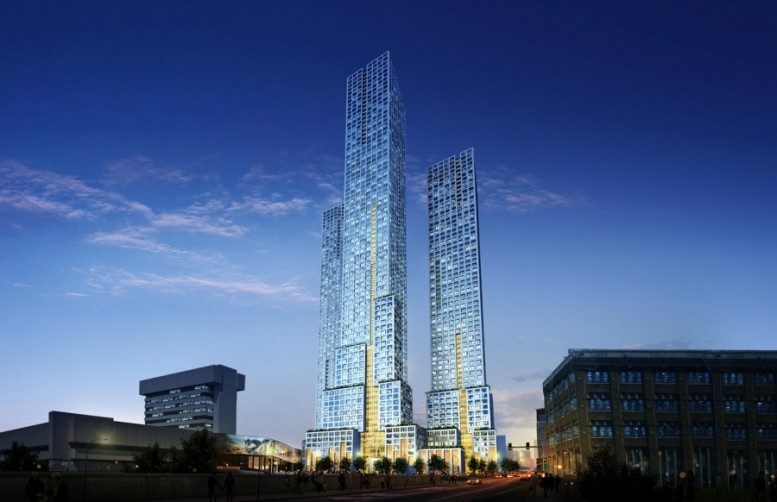 Whether driving out from the Holland Tunnel, or taking I-78 East or Route 9 into Jersey City, the sight of Journal Squared, designed by HWKN/Hollwich Kushner and Handel Architects and developed by Kushner Real Estate Development, is hard to miss from the highways. Perched on the high hills above the PATH train station to the west of the downtown district, the views and sights of both Jersey City and Manhattan are unbeatable from the top floors. 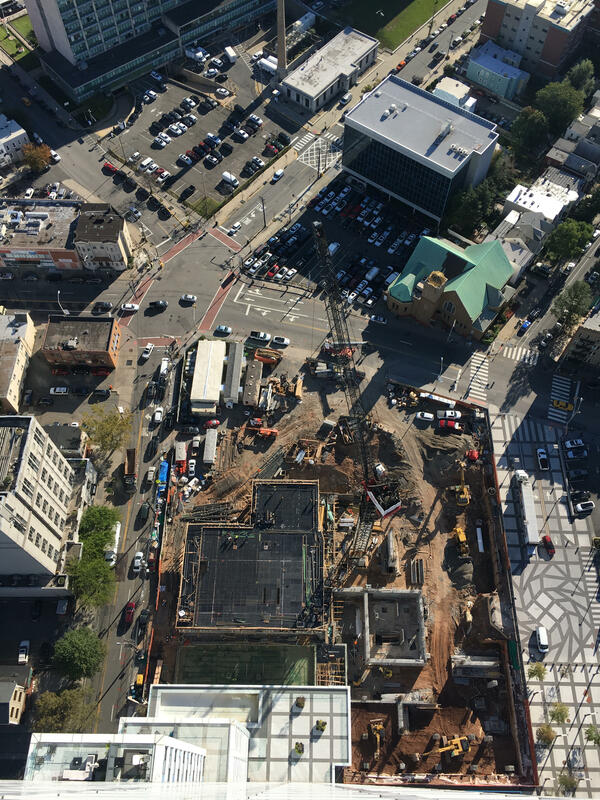 For the past couple of months, work has significantly geared up on the second phase of the complex, which will imminently yield a 72-story residential tower standing 759 feet. 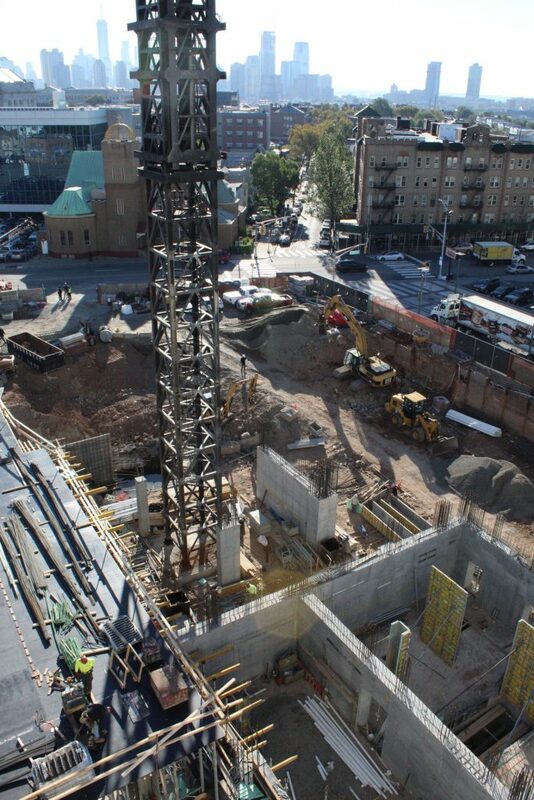 The crane and surrounding foundation walls of the second Journal Squared tower. Photo by Michael Young. 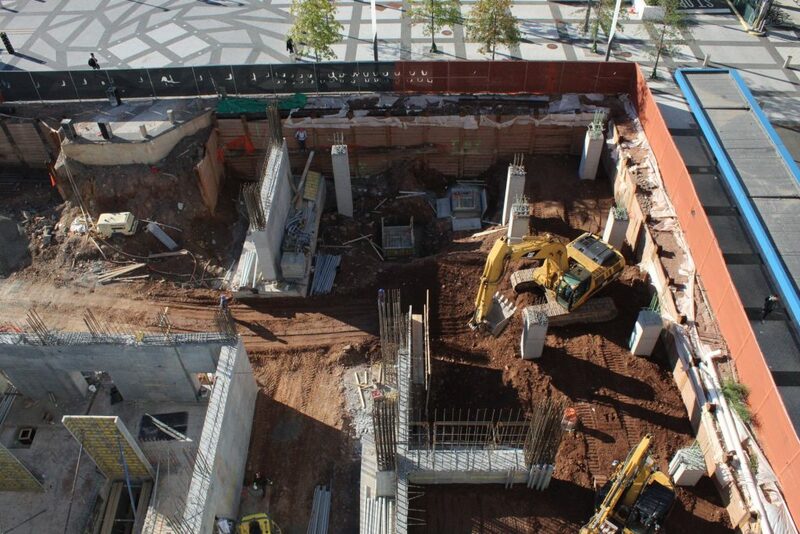 The outer perimeter of the second towers footprint and columns that are currently being formed in place. Photo by Michael Young. Architecturally identical to its existing shorter twin, it will have 700 units, 18,000 square feet of retail space, and a gross square footage of around 1,000,000 square feet. 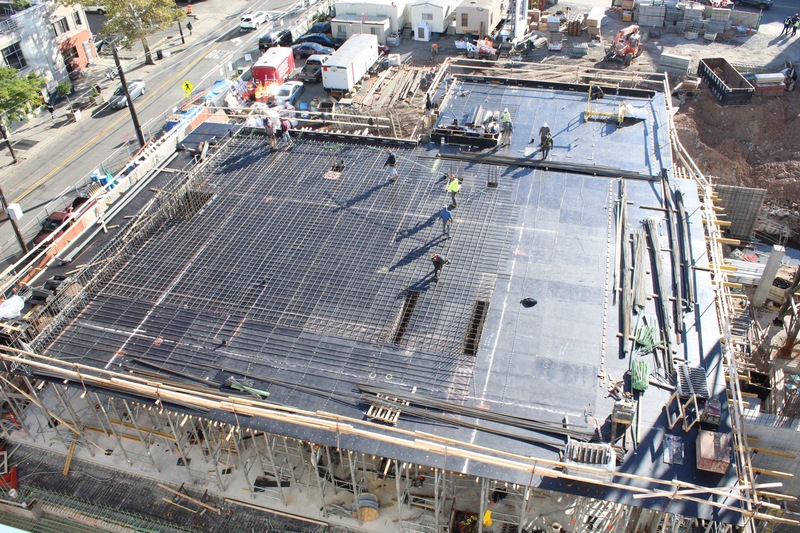 The construction crane and foundation work are both present as concrete pouring and formwork have been progressing at a quick pace. A large part of the retail floor is being assembled and poured alongside Pavonia Avenue to the north of the tower’s footprint that quickly went up in the past couple of weeks, while progress on the skyscraper portion has also been substantial. Completion of the second phase is expected sometime in 2020. 2 Comments on "Journal Squared’s Second Phase and Tallest Tower Now Rising in Jersey City"
Please pardon me for using your space: Expectance on developments not enough. I used to live round here and the area is so run down, hopefully when this development is complete the whole area will be given a lift. The concern is the already crowded PATH will become super-crowded when 2000 or so extra people are fighting to get on, so hopefully they’ll make them more frequent, as it’s a useful service. Also, would be good to have the shops in the station full and some decent restaurants or bars in the area.